We are committed to improving our buildings to provide the best possible facilities for learning and enjoyment. Phase 2 of Future Halsway will see several important changes which will vastly improve the experience of our customers. • Provide a new dining room for guests so the long room can be used exclusively for activities. • Restore the historic rear of the manor to its former glory. • Provide more workshop spaces for learners and guests. We plan to reinstate the rear of the manor, knocking through the Mardon Room, existing kitchen and wash up into a permanent dining room. When this large space is not being used in its entirety it can be segmented to provide an extra workshop area. • Build a new, fit for purpose kitchen and wash up space. We will build a new kitchen/wash up to the rear of the manor. 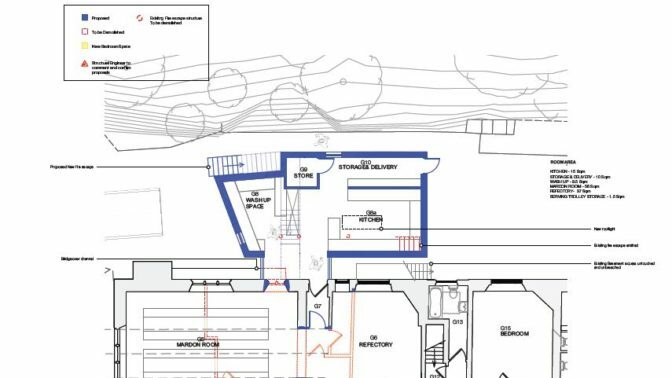 This modern, sympathetically designed space will provide better ancillary services and utilise an unused space invisible from the front of the property. What will this mean for Halsway visitors? • The Long Room available all the time for activity. • More spaces to enjoy courses in. • Better dining facilities and spaces to relax when not taking part. Please look at the attached architects proposal for more details here. Please visit our support us page for details about how to donate.